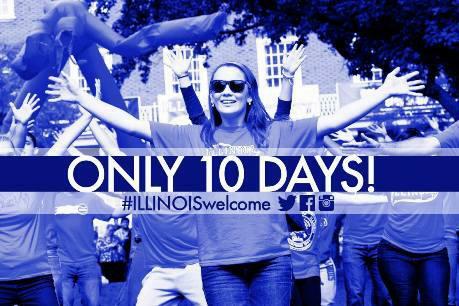 Student orientation week is one of the busiest and most exciting weeks of the college year. Hoards of excited and nervous freshmen and their parents descend on campuses across America ready to begin their higher education journey. How a university handles this tentative week is extremely important as incoming students need to feel welcome and included in their new academic home. So how exactly does a university create a welcoming atmosphere for students? A well thought out social media strategy is vital as it also provides a unique window of opportunity to gain new followers and reach new audiences through the new students and their families. First up is the University of Michigan’s ‘Dorm room inspiration’ board on Pinterest. It can be hard to find a genuine use for Pinterest in the world of higher education but we really liked this one. This is such a great way of getting incoming students excited about where they are going to be staying. Links to Pinterest boards can also be readily shared on facebook, Instagram and twitter. So, go on get pinning! The good folks at University of Illinois at Urbana-Champaign have been pulling out all the stops to ensure their incoming class feels right at home. Their Illinois Welcome campaign includes a hashtag campaign; #illinoiswelcome, blog posts, a countdown on facebook and some beautiful Instagram photos taken on campus. Taking advantage of as many social media mediums as possible is a sure fire way of reaching and engaging a wider audience. However, it goes without saying that a social media presence needs to be both active and of benefit or interest to your usersin order for it to be successful. Ohio State University has done a terrific job in extending a warm social media welcome to their incoming class of 2018; from sharing a ‘Hidden Gem’s webpage featuring the oldest and most historic buildings on campus to building excitement and momentum with the #new2OSU hashtag. We also couldn’t go without mentioning their retro throwback thursday post starring this gorgeous move-in photo from 1950. There’s a million different ways you can use social media to build excitement in the weeks before, during and after move-in and orientation week. Try to create posts and campaigns that are helpful and of interest to students and most of all have fun with it!